Looking for fall decorating ideas? Tour these gorgeous homes ready for the autumn season, including simple touches I added to our kitchen and dining room. Hello again, friends! 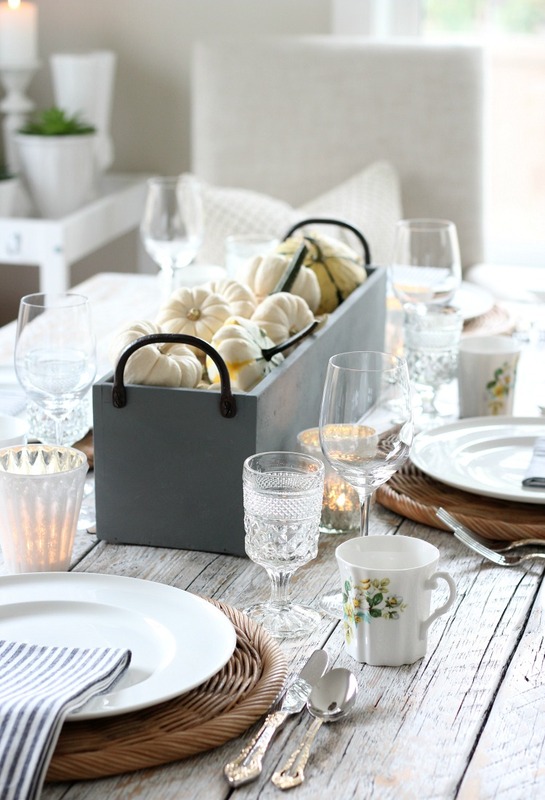 I’m back today sharing more fall decorating ideas for the kitchen and dining room. I love seasonal decorating and had so much fun adding a few simple touches to our combined space. 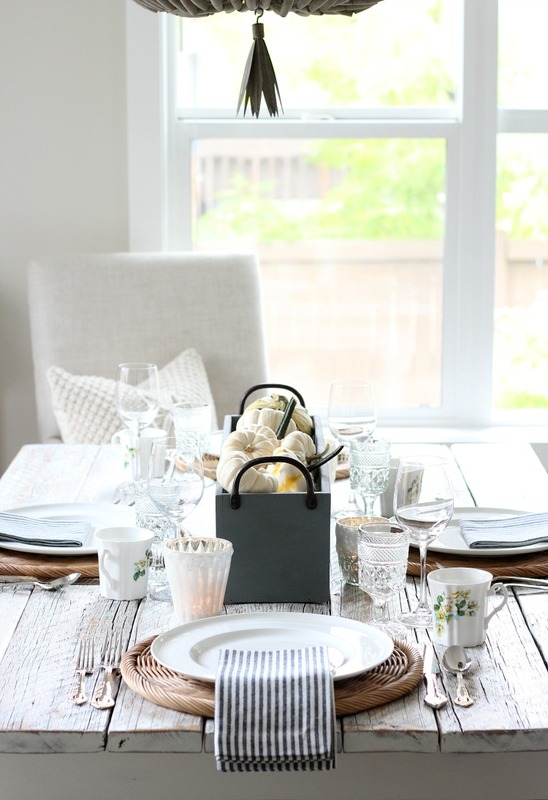 I’m honoured to be joining Krista as part of her Seasonal Simplicity Fall Home Tour along with over 30 other bloggers who are sharing their homes as they get ready for fall. If you’re coming over from The Turquoise Home, welcome! I’m certain you’ll be inspired to tackle some decorating projects of your own once you’ve taken a peek. You’re in for a real treat! 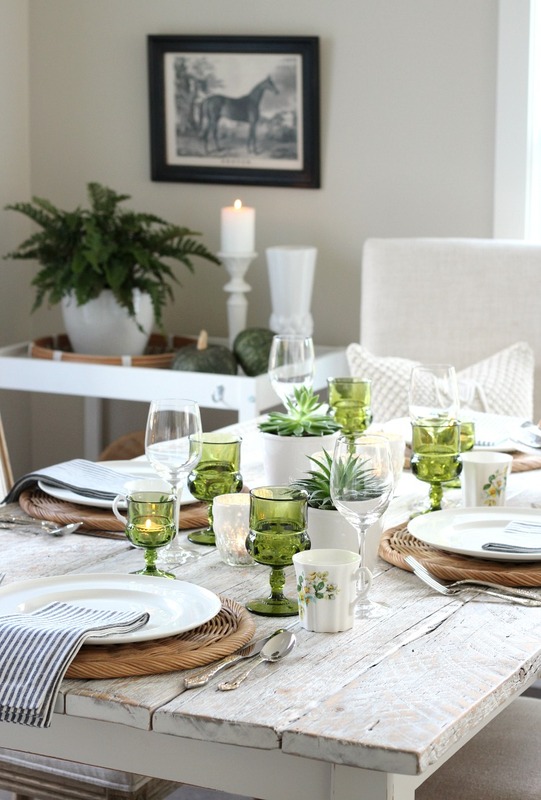 On Monday, I shared my eclectic fall tablescape decorated in vintage green glassware, thrifted floral mugs, pretty gold flatware and other beautiful decor pieces. It’s a fun tablescape I’ll be putting together again for upcoming fall dinner parties. 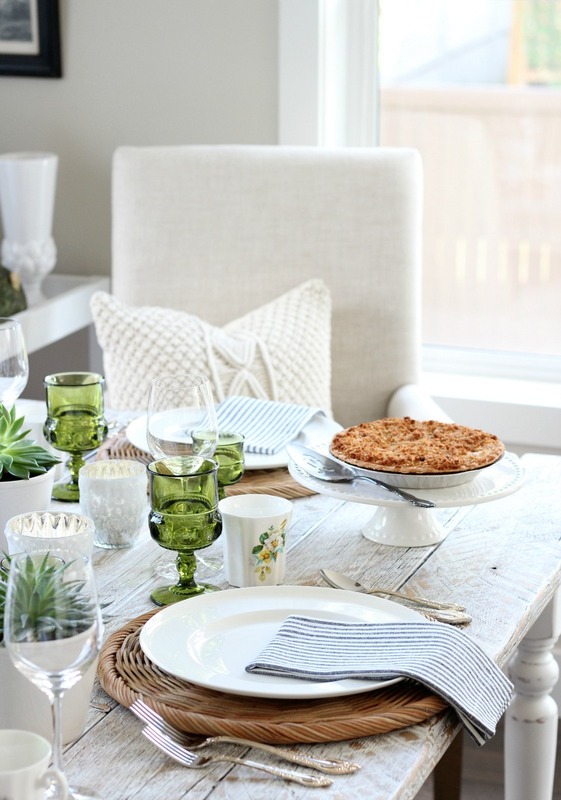 Go HERE to some other tablescapes I’ve put together in the past. For something a little different, I moved the succulents to the bar cart and added this faux concrete planter box filled with gourds and pumpkins. (On a side note, did you know those little white ones are called Baby Boo? So cute!) It will serve as a simple fall table centerpiece whether the table is set or not. I made it using a wooden box I picked up at the thrift shop for only $5. Want to make your own? I shared the instructions in this post. Such an easy DIY project! I also replaced the green glassware with vintage pressed goblets I found at the thrift shop a while back. I think the table has a totally different vibe with only a few small changes. On the other side of our kitchen, I kept things simple. 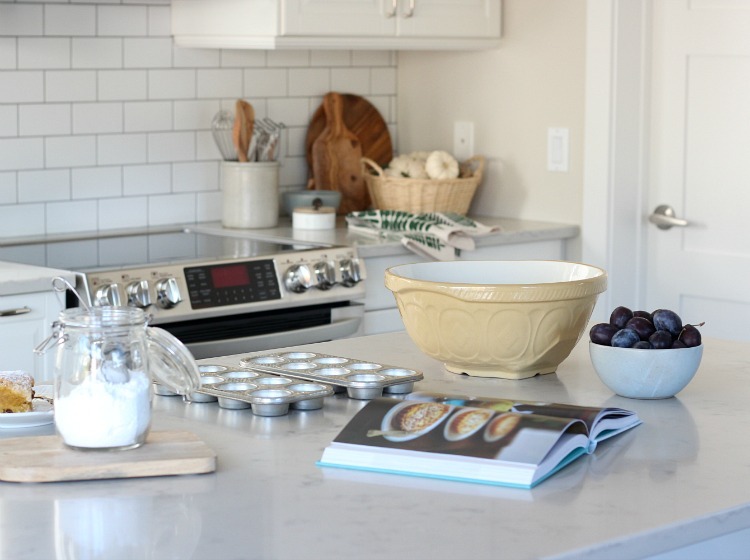 If it’s your first time here, be sure to check out our kitchen renovation details. I have a few decor staples that I usually have on display year round like wooden boards, cake stands, baskets, utensils and bowls. For a new look, I simply move them around. 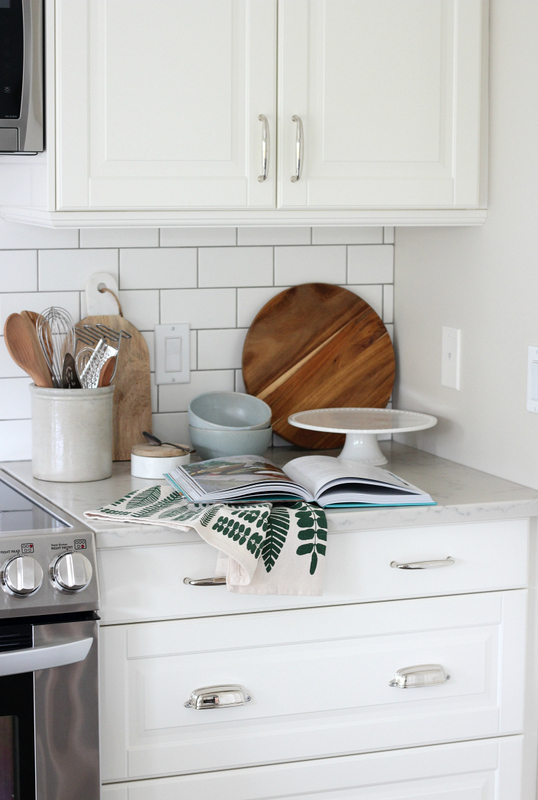 Each season, I like to freshen up our kitchen with a few inexpensive items. I thought this green leaf tea towel was pretty and I couldn’t resist the pumpkin handsoap that smells so delicious! I also brought the herbs in from outside before the frost got them. Easy to snip a bit here and there. They really do add so much flavour to dishes, don’t they? Bowls and baskets of produce on the counter are another good way to bring in some seasonal colour. Or, try adding dishes in a fall colour like this muted yellow gripstand mixing bowl I found at a thrift shop for next to nothing. Have I mentioned how much I enjoy the hunt? Fall is my favourite time to bake. I cheated and picked up these pumpkin scones at a local bakery, but I did manage to whip up a batch of plum and berry tarts (similar to this recipe) yesterday. Have you baked anything lately? 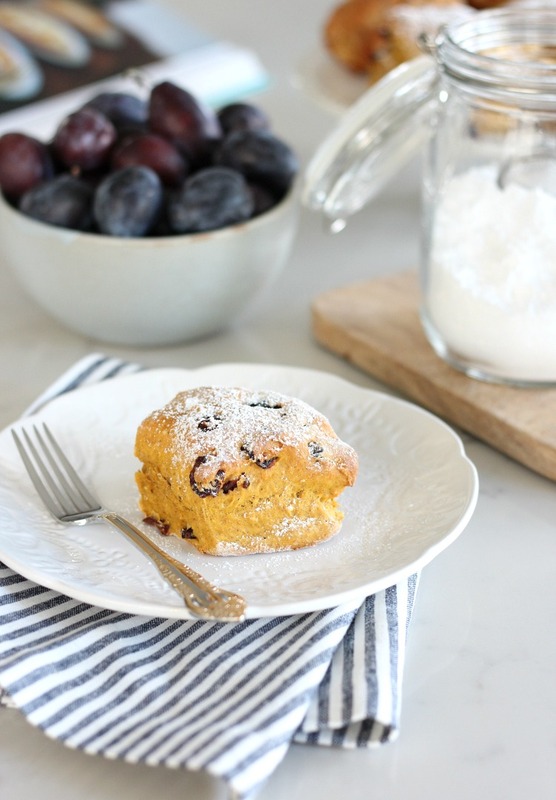 Around here, the weather has been chilly, rainy and even snowy, so baking is perfect. Well, that’s how our kitchen looks for now. 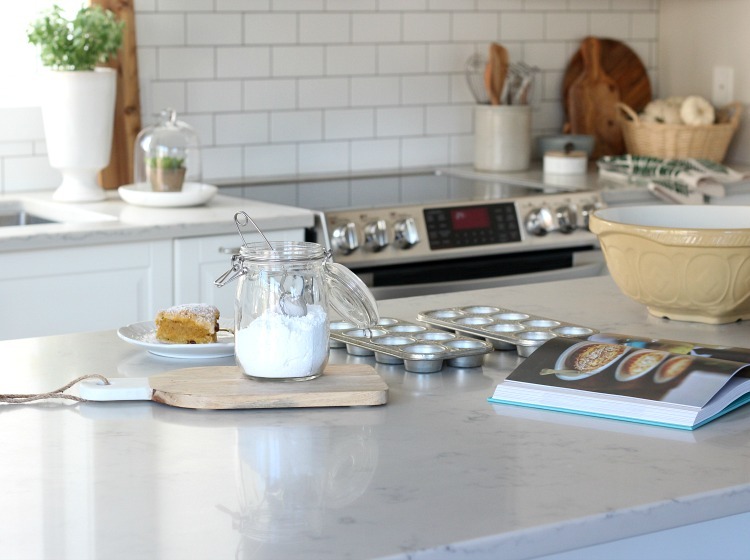 To see how I decorated our kitchen last fall, click HERE. I can’t tell you how much it means to me that you stopped by, whether it’s your first time visiting or you’re a long-time reader. If you liked this tour and want to see more, I’d love for you to SUBSCRIBE. Now be sure to head over to visit my friend Taryn Whiteaker. I know you’ll love her creativity and style. And don’t forget to visit the other bloggers sharing their pretty fall decorating ideas throughout the week! Super pretty, Shauna! 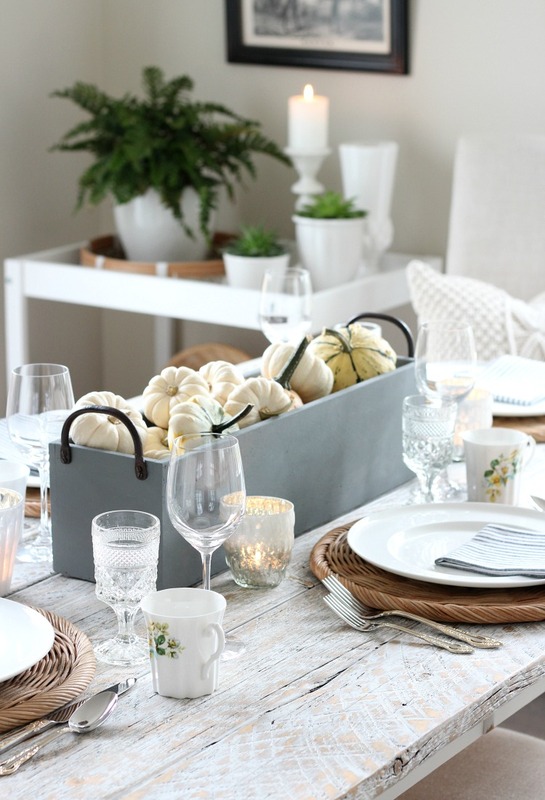 I love your gorgeous tablescapes, and those mini white pumpkins are the cutest! Thanks for joining in on this tour! Beautiful spaces, Shauna! :) Love the colors. I love your table so much! 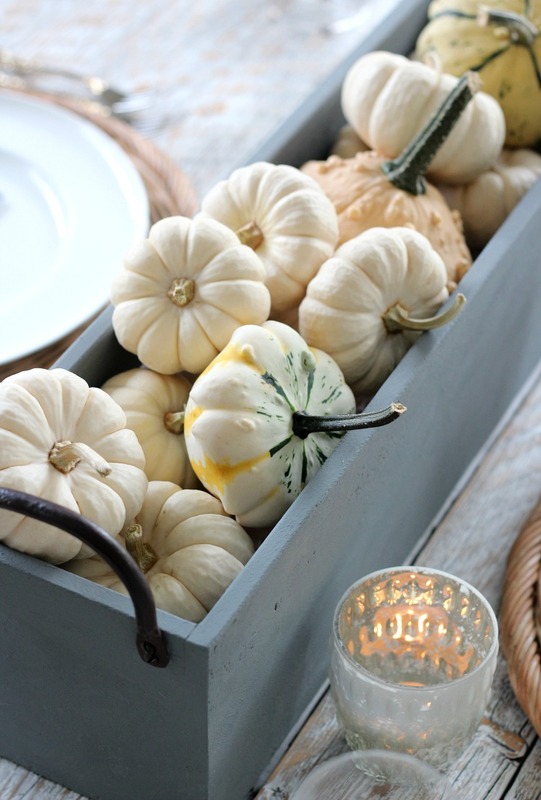 Beautiful pumpkins and casual but elegant ambiance! 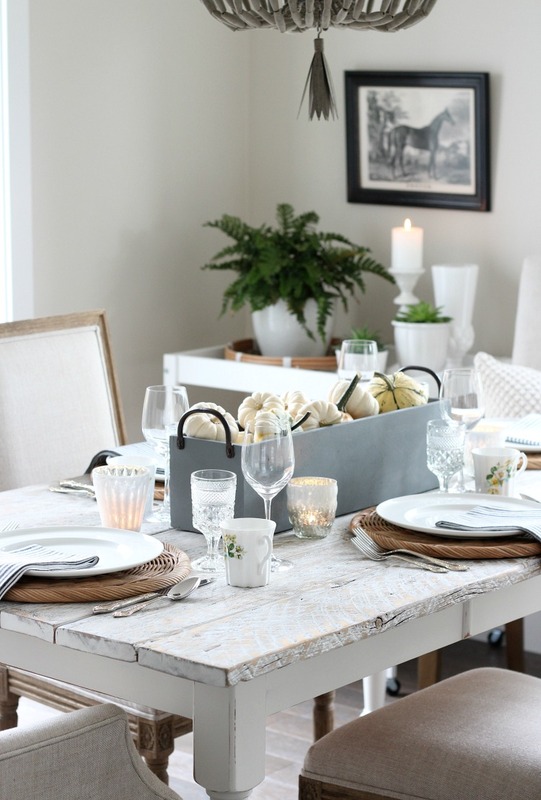 I’m new to your blog and would like to say how much I love your simple yet beautiful decor. I love your pretty white kitchen! 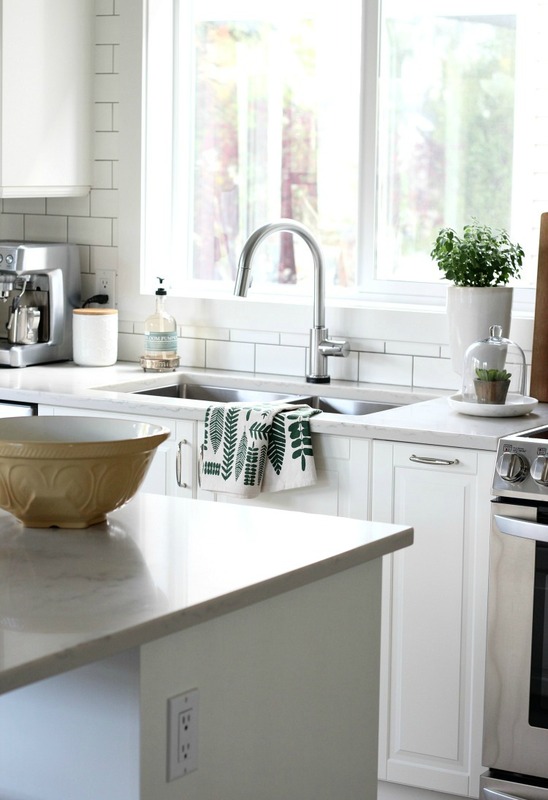 (I’m in desperate need of a kitchen remodel, but that’s not happening anytime soon), Your rustic white table makes my heart go Pitter patter! Looking forward to future posts!